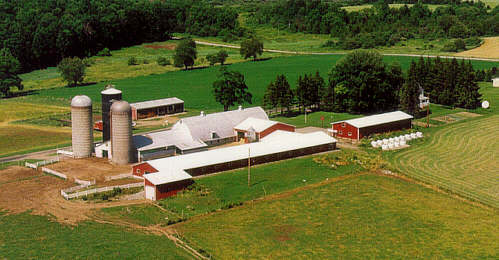 Ovaltop Holsteins is a family farm located in the Leatherstocking Region of Central New York. The 100% Registered Holstein herd consists of approximately 90 milking cows and an additional 75 head of young stock. Alfalfa, corn and some small grains are grown on 470 acres of gently rolling fields. The philosophy at Ovaltop has always been to breed a top herd of Registered Holsteins improving each generation in pursuit of exceptional type, outstanding production and increased genetic potential. It is also the goal at Ovaltop to grow the best quality forages possible to feed the herd. Built a new tie-stall in 1991, increasing the herd size from 45 head to 90 head of milking cows. Ovaltop Holsteins welcomes visitors from 11AM to 4PM at the farm on the Chyle Road in the Town of Warren. Directions: 3 miles east of Richfield Springs on US Route 20 to the hamlet of Warren, turn north onto Little Lakes Road for 3 miles to Chyle Road, turn east onto Chyle Road, farm one mile on right.